Digitsole has launched its wearable technology show insoles on Kickstarter. These insoles allow you to augment the shoes or boots or trainers you already enjoy wearing with wearable technology. It sounds like a good idea – allowing people to take the wearable technology with them when they change shoes. 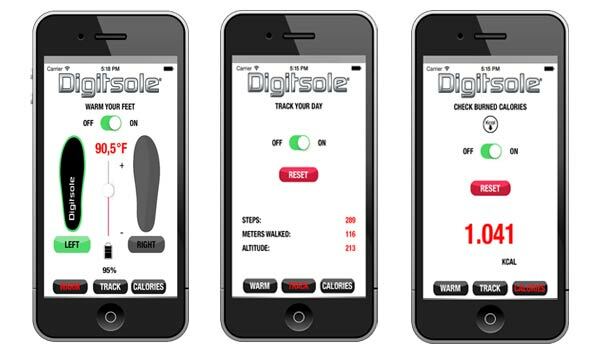 Digitsole offers wearable tech staple monitoring that you might expect from a smart shoe. It allows you to keep track of the distance you have covered and also gauge the amount of calories that you have probably burned in that process. However it also has a great ability that will warm the cockles of your heart – it actually contains heating elements to warm your feet – if required. Like the Kickstarter promotional blurb suggests “Everybody has suffered from cold feet, whether on their way to work, while walking, skiing, hiking, or even riding their bike or motorcycle.” So to be able to monitor and control your feet temperature from your smartphone is a very neat function. In the app a user can set the desired temperature for each foot individually. Once the Digitsole insoles pair with your smartphone, via Bluetooth 4.0, the built-in thermostat automatically warms your feet if they drop below the desired temperature settings. Digitsole is charged via a standard USB cable and works for seven to eight hours from a single charge. The highest temperature you can set is 40 degrees Celcius (104F) which should be plenty! The main structural materials are Neotech for its light weight and vibration control and Poron for shock absorption. It also features a specially constructed reinforced shock heel system. The insole is covered in Soft Touch PU micro-fibre. One insole weighs about 110g depending upon the size you order. If you are interested in this project then hop on over to the Digitsole Kickstarter page which just opened for business today. The minimum level of funding to secure a pair of Digitsole insoles, and free app, is a rather pricy US$99 (+$20 shipping outside the US). Hopefully that fact won’t give you cold feet, as the project is seeking $40,000 in startup funding.